Chris Heather, Senior Planner, SHW, says: "The Draft London Plan, now under review, examines a range of issues that will affect the lives of everyone with a connection to the capital. Housing delivery continues to be critical, with the updated plan showing a targeted 53.2% increase in new housing compared with the adopted London Plan, a rise from 42,389 to 64,935 per year. "But this only tells part of the story and masks significant geographical variations. There is a definite shift in focus from inner to outer London. In the existing plan, just over half (54%) of the overall housing target is allocated to the smaller inner London boroughs; the proposal is to cut this to 41%, leaving 59% of new housing to the outer boroughs. "A closer look at the individual borough totals demonstrates the full impact of this shift. Whereas it is proposed to reduce targets for the likes of Hackney, Kensington & Chelsea and Islington, the opposite is true of boroughs further out. At the top of the list is Merton, where the targeted increase is a massive 223%, followed by Bexley and Hillingdon in second and third place. "But these percentages paint a different picture to the raw numbers for housing supply in some boroughs. For example, Tower Hamlets would still have the second-highest allocation of any borough and Merton would have the 27th highest. Some of Hackney and Tower Hamlets' allocations have also been moved across to the London Legacy Development Corporation, the body set up to redevelop former Olympics 2012 sites in east London. "So although the trend is significant, it is not correct to assume that inner London has now done its part to meet housing targets. "On a proportionate basis, average housing allocations per inner and outer London borough in the adopted plan are over 15,000 and under 10,000 respectively. 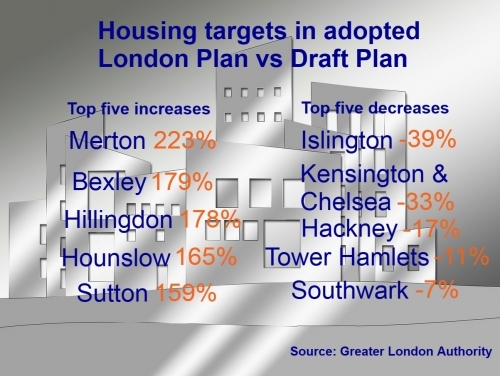 The Draft London Plan proposes to almost equalise these targets at around 18,500 each. However, given the difference in size between boroughs, the inner London boroughs are still expected to provide proportionately more housing, by this measure anyway. "Overall, the message appears to be that inner London boroughs will still need to work hard to meet demand for new housing, but those on the outskirts will have to work much harder than they have previously. This represents a real challenge for individual boroughs and a real opportunity for developers to respond to the need for housing across the capital." This piece originally appeared in Property Week, 15th March 2019.